Although many people are unaware of it, the issue of diesel engine electrolysis damage is very serious. Electrolysis damage happens when a short occurs in the electrical system of an engine. This results in a current being passed across the elements of the cooling system, resulting in an electrochemical discharge. This could mean serious corrosion and rapid deterioration of certain engine components. Electrolysis could happen to any type of engine; all it needs is a loose ground. However, due to the makeup of the diesel engine, this can be a more common problem for them than for gasoline engines. 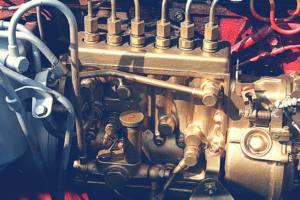 Internal combustion engines can use either diesel or gasoline for fuel. A diesel engine differs from a gasoline engine in fuel delivery. In a gasoline engine the fuel and air moisture is compressed and ignited via a spark plug. In contrast, the diesel engine has no spark plug. Instead, the air alone is fed into the piston and compression begins. Once the air is hot enough, the diesel is injected into the piston directly. This results in the power stroke, which drives the crankshaft forward. The pistons are surrounded by a coolant system that ensures the diesel system operates efficiently, even at the massive temperatures needed to cause a power stroke without a spark plug. It’s in this coolant system that the entire diesel engine electrolysis problem begins. It's a simple process to test to see if electrolysis is occurring within an engine. It requires a Digital Volt-Ohm Meter (DVOM) connected to the negative terminal, with the positive lead replaced by something that can dangle within the coolant. It is important that the lead does not touch the sides of the radiator. The reading on the DVOM should read no more than 0.300 with the engine off. If the reading is higher than the coolant, it needs to be flushed since it is carrying a charge. Once the initial value is determined, the engine should be started and revved to a high RPM. Each electrical item in the vehicle should be turned on and off while monitoring the DVOM. If the reading ever spikes to anything above 0.300, there is serious risk of damaging the engine. All it takes for electrolysis to affect a vehicle is a bad ground. Once that happens, the process starts eating away at the internal parts of a diesel engine very rapidly. Although electrolysis can be a cause for concern, Nitro Nine has a range of products to keep your diesel engine performing at its best. For example, our ZP-518 Diesel Injector Cleaner is a great solution for carbon buildup within a diesel engine. Also, the ZP-707 Motor Flush can be used to clean out varnish, gum and carbon, as the sub-surface lubricant gets into the metal quickly. This also stops further deposits from forming on the metal for some time, thanks to its protection. Nitro Nine is the manufacturer of a wide range of additives that can be used in a number of different engines. Visit us online today to find out which one is right for your diesel engine!